Ibtadai Tibbi Imdad | Health Tips in Urdu Read online or download Ibtadai Tibbi Imdad by Ibrar Ahmad in PDF format, Ibtadai Tibbi Imdad is Urdu translation of English term first aid, this book is very helpful for everyone. this book provides health tips in Urdu. 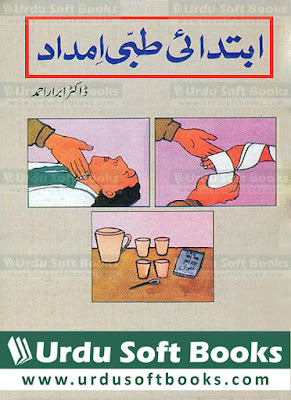 Read online or download Ibtadai Tibbi Imdad by Ibrar Ahmad in PDF format, Ibtadai Tibbi Imdad is Urdu translation of English term first aid, this book is very helpful for everyone. this book provides health tips in Urdu. Daily life is full of uncertain events and accidents. In emergencies cases where quick medical facilities are not available, a person who have knowledge about first aid can provide emergency rescue to affected people. Emergency rescue help is a great virtue and human ethical responsibility. This book covers important health tips in Urdu language, In this book "Ibtadai Tibbi Imdad by Ibrar Ahmad" all possible emergency cases and health tips are described in details and also provide possible remedial solutions in very easy format, all topics are described in step by step manner and relevant images are also included for batter understandings. We are going to build largest Urdu books library, where you can read online and download Urdu health books in PDF format. You can also share these Urdu health books with your friends through social media sharing buttons which are available on each page. This time you are watching another beautiful Islamic Book Ibtadai Tibbi Imdad by Ibrar Ahmad, this book consist on 127 pages and contains 7.45 MB disk space. You can read online or download Ibtadai Tibbi Imdad in PDF Format using below links. Your feedback and comments will help us to improve our Urdu Books collection.